Do you believe in New Year resolutions? I do. One of my resolutions is to write more often and share my thoughts, ideas and experiences. And so I got down to doing just that a couple of days ago. I was in a meeting earlier this week and when the introductions were being made, I sensed that there seemed to be an awkward moment of indecision (and fumbling) by a gentleman about how to introduce a lady to the seniors attending the meeting. Have you experienced anything similar sometime? We are all confused at some point on how to introduce a lady in the workplace. Should the lady be introduced first or the seniors or colleagues? What is appropriate? What about at a social gathering? Your boss or senior to be addressed first then a junior person in the company. Clients are always to be addressed first. Then your boss or someone from your company. A woman will not be perceived as a competent professional if she acts or wants to be treated according to chivalry. A man who treats a female client or colleague in a chivalrous manner will be perceived as condescending. Socially it is appropriate to introduce a man to a woman. So a woman will be addressed first. Within a work environment, consider only seniority and position of the person while making introductions. Do add a point of common interest for both parties involved. In a formal business meeting that would mean a brief background/role of the junior member being introduced to the senior. Socially too this ensures recall and the start of a conversation. 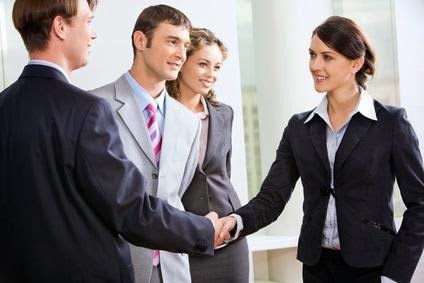 So go ahead and make those introductions with ease socially as well as at the workplace. My module on Business Etiquette covers this and more. Have more questions or want to share some experiences? Feel free to comment below and I will respond. Little things that matter much. I would love to read more of such informative pieces..
Really Suhasini, matter of fact and informative... Keep posting and enhancing our knowledge!